Just got back from a few days in the South East. Enjoyed Canterbury a lot, both for its cathedral and the three excellent and very different meals we had there: the world’s thickest and meatiest beefburger at The Dolphin, huge pots of sweet mussels at Café Belge, and a Michael Caines good value “amazing grazing” lunch. What better way to recharge flagging tourist batteries than a good quality leisurely light lunch in a restaurant that manages to be formal and relaxed at the same time? But I did not intend this to be a restaurant review. We visited a couple of vineyards, Chapel Down and Wickham, also the English Wine Centre, and I wanted to share some thoughts about them and their wines. I approached these places as an ordinary punter – a tourist if you like. I did not phone in advance saying I would like to taste some wines to write up on my blog. Apart from anything else, that would be lying as I am not exactly going to “write up the wines”. There were 13 wines for sale at Chapel Down and we expressed interest in tasting as many as we could. We were soon disabused of that notion. You can only taste 3 wines free! We explained we were perfectly happy to pay for our tasting samples, but no they couldn’t do that – something to do with taxation. Hmmm. But if we wanted to taste more, then we could go on one of the thrice-daily guided tours at £9.00 a pop, after which we would get a tasting of 8 wines. So using that ruse we could taste 11 of their 13 wines – in fact we later realised that as there were two of us, by sharing samples we could actually taste everything. As a tour was soon due anyway we signed up. In the meantime we wandered around the vineyards at Tenterden a bit ourselves. The map we picked up was obviously a bit out of date but enabled us to find our way around. The oldest vines were Bacchus and Auxerrois from 1987, and the most recent additions according to the map were Bacchus from 2007. 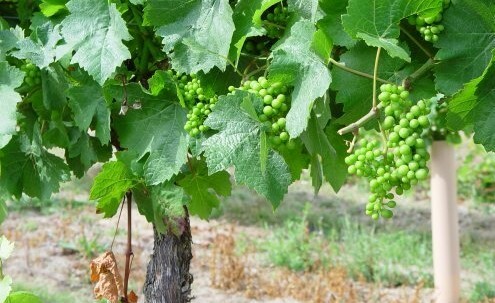 About half the area had been planted with Pinot Noir, Pinot Blanc and Chardonnay in 2004, and there was also a block of Pinot Noir that dated back to 1999. A vine of that venerable Kentish Pinot Noir features at the top of this article. All vines were Guyot trained, but to a greater height than I am used to seeing in other places. I was surprised that several row end posts and nearby vines were on the floor. I wonder how that could have happened – and how long it will take the vineyard to get around to repairing the damage. Finally, before leaving the site we popped upstairs for lunch at Richard Phillips. I was surprised to find the restaurant was full considering it was mid-week and the shop downstairs did not seem very busy. Anyway, we ate in the bar, which was not a problem for us. The pea and ham starter was excellent – good texture and intense and fresh flavours – but both of us found our main courses disappointing. A rather bland tasting fish dish, and two parts of my trio of lamb were in various stages of dessication. That does all sounds rather negative, doesn’t it? But I actually came away pleasantly surprised. My only other encounter with an English vineyard – Chilford hall many years ago – had been dire. By contrast this was a smooth and professional operation that offered some serious wines. If only they did not put up so many barriers to tasting them! Two entirely separate enterprises, but I’ll deal with them together. We spent a lot less time at these places than Chapel Down, and the wines I remember from them were all Wickham wines. The English Wine Centre is not a vineyard. Most importantly from my point of view it is a shop – though it also has a restaurant, and markets itself as a wedding venue. We were asked for, and were given, a tasting. At this point we were feeling a little fussier than at Chapel Down and asked for dry whites and sparkling wines only. That narrowed the field quite a lot as sparkling wines were not on tasting mid-week, and it turned out that one of the dry whites available was the Chapel Down Flint Dry we had already dismissed. So we finished up with four wines, 2 of which we didn’t like, and two we did. The ones we liked were both from Wickham – more on those later. They had an excellent selection of English wines for sale, and we bought quite a few bottles there. The main downside was the prices – a good 30% or so over cellar door and other retail outlets. However, if you are intent on buying English wines the convenience of having then under one roof is an advantage. Next stop was Wickham. First we had a quick look at the vines by the restaurant. Not sure exactly what we were looking at, but they were cordon trained and had obviously been tarted up with roses and lights to enhance the view from the restaurant. They also seem to have been equipped with heaters – a bit like smudge pots, but these were positioned under the vines. Inside the shop we were offered a no-fuss tasting of all their wines, so top marks for that! The ones we liked and bought are described below. I am afraid I can remember little about the ones we did not like. Generally speaking, I had my pre-existing feelings about English wines confirmed by the experience. The better dry white wines were light and herbaceous – tending towards Sauvignon Blanc aromatics. On the right occasion I could enjoy these wines. It is not my favourite style, but I would say that about Sauvignon Blanc too. At their worst they were acidic and watery. English sweet wines and red wines I would generally simply avoid. The sparkling wines made from German crossings were quite pleasant, but horribly overpriced in my opinion – a comparable experience to Prosecco, but at twice the price. The sparklers made from proper French grapes I thought were comparable in both quality and price to Champagne. To be honest I think Champagne is overpriced in the UK too, but at least that means the English equivalents can compete. This entry was posted in General, My tasting notes and tagged england, food, restaurant, tasting note, travel. Bookmark the permalink.